Ramadan fasting is like no other Islamic ritual. In the month of Ramadan, those who never perform the pre-dawn Fajr prayer get up even earlier to eat, only to abstain until dusk. And after a month of that, even those who would otherwise never set foot in a mosque line up in unison to kneel towards Mecca. For an entire month, from cooking, attire, TV to intimacy — the very lifestyle of a billion plus people change. Except perhaps the aversion to pork, observance of, or at least respect to, the Ramadan fasting is arguably the most ubiquitous characteristic of Muslims. Given its prevalence and ubiquity, Ramadan must have observable economic impacts. Exactly what might they be? In a fascinating paper, Filipe Campanile and David Yanagizawa-Drott of Harvard’s Kennedy School provide us with some answers. * Summary — fasting makes us happier, if poorer. A staple of political rhetoric in Bangladesh is to ensure affordability of rice, lentil, oil and salt. Throw in a kilogram of coarse rice, 250 grams of red lentil, 40 ml soya bean oil and 10 mg salt and we get a rather bland plate of khichuri. CEIC Asia database provides monthly retail prices of these essentials in Dhaka with a lag. Currently, the latest data point is August 2014. Still, using the bland recipe and prices (and smoothing the data by taking a 12-month moving average), we can get a sense of how the price of our plate of khichuri has evolved over time — for example, when BNP was turfed out in January 2007, such a plate cost around 35 taka, which rose to around 60 taka when the Awami League returned to power in January 2009, and was around 70 taka when its five year term expired. Of course, to say anything sensible about prices, we need to have a sense of income. From the same source, we can get daily wage of a skilled factory worker. Her wages went from around130 taka a day in January 2007 to over 210 taka two years later to over 300 taka further five years on. Putting the two together, we can get what I am going to call the Khichuri Index — plates of khichuri an average industrial worker can buy in Dhaka. The chart below shows how the index has evolved between January 2000 and August 2014 (the period I have data for). 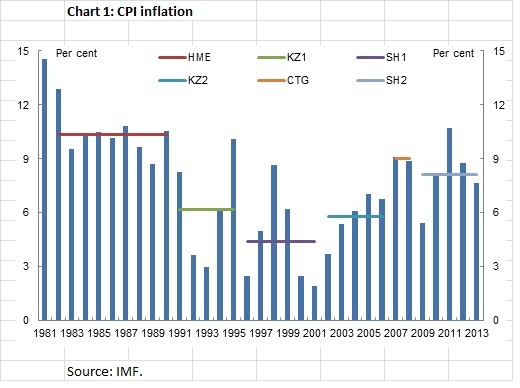 For those coming in late, even though inflation has risen under the current government (Chart 1), real GDP per capita has grown by around 4½ per cent a year under successive governments over the past decade. Over the last couple of weeks, I have had a bit of correspondence about inflation. This post answers some of the questions.